Why Aren't We Changing Waianae's Culture Of Fistfights? Why Aren’t We Changing Waianae’s Culture Of Fistfights? “Nobody seems to care,” says a man who lives near where schoolkids regularly congregate to watch two or more students duke it out. All is quiet in a cul-de-sac off Ala Akau Street, until a group of 25 to 30 students walks over from the high school across the street. They typically gather right after school on a grassy hill surrounded by a pathway and lights – officially termed a “common area” by the Ulu Wehi homeowners association – at the end of the road closest to Farrington Highway. They form a half circle and watch as two or more students fistfight. 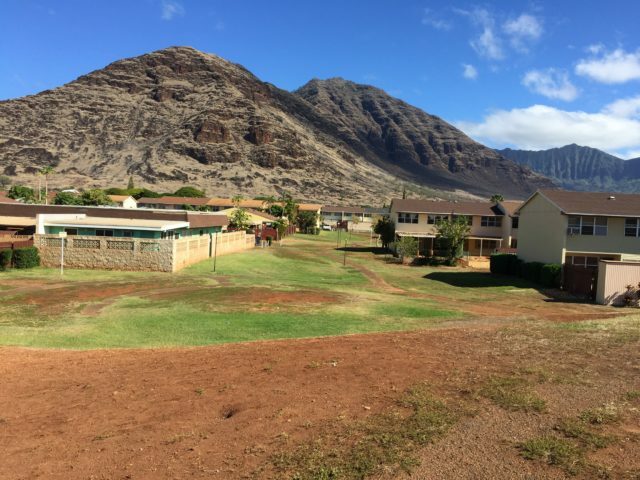 The view from atop a hill in the Ulu Wehi community common area, where residents say Waianae High School students regularly come to fight. Ulu Wehi residents say fights take place once or twice a month — and sometimes more than once a week. The area has long been a place for people to come and settle their disagreements. Its nickname, “the ring,” is said to have been around for 30 years. Some residents are concerned that the fights could get worse if weapons are used or adults jump in. But fighting has long been part of Waianae’s culture, and while there have been efforts to change that, the students keep coming to the hill. An organization that aims to direct youths away from violence said that fights among high school students are not uncommon, but for the Ulu Wehi community, it’s a big issue. Richard Drake Jones, 66, moved to Ulu Wehi four years ago. The community development in Waianae includes 380 units on 70 acres. He lives with his wife, stepson and two dogs in a unit adjacent to the common area. When the crowd for a fight is large, it spills into his carport and sometimes blocks access to the street. Jones said he’s seen as many as 100 teens gather to watch, ignoring numerous “No Trespassing” signs. The fights – which can involve boys or girls – can last from a few minutes to half an hour, often depending on whether the police show up, he said. Over the past four years, Jones estimates he has called the Honolulu Police Department about 100 times. He’s also brought up the issue in letters to Mayor Kirk Caldwell and in discussions with the homeowners association and Waianae Coast Neighborhood Board. The mauka view atop a hill in the Ulu Wehi common area. HPD’s District 8 oversees the area from Ewa to Kaena Point. 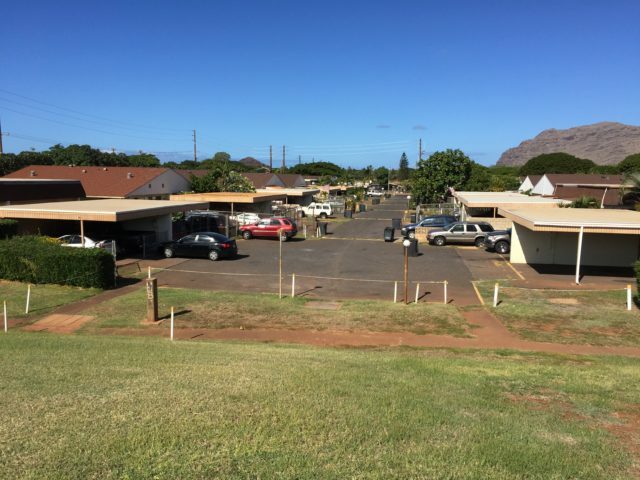 HPD spokeswoman Michelle Yu said in an email that its officers are aware of the occasional fights and large gatherings because of reports from residents. Police regularly patrol the area, especially before and after school hours, Yu said. Students hang out in the Ulu Wehi common area because it’s between the high school and intermediate school and close to a bus stop, Yu said. Charles Ramaila, a resident and site manager for the complex for the past 18 years, said the fights involve not only Waianae High School students but also intermediate school students. They always occur right after school lets out, he said. Because of that, he and his staff, who have offices nearby, keep an eye on the area in the afternoons and turn on the sprinklers if they see a large group of students walking over. But this only discourages them from fighting in the wet zone, and they’ll sometimes find other places in the complex that Ramaila can’t see from his office or go to a neighboring public park. “The guys fighting, it’s all about reputation,” he said, adding that the more spectators they attract, the better it’ll be for those reputations. Many tenants are concerned, Ramaila said. The topic is regularly discussed at the homeowner association’s annual meeting and in fliers sent out to residents, according to Jonathan Acosta, president of the homeowners association. Ramaila said he’s even seen parents come along to watch the fights, which he fears could lead to escalation. If you get into a fight on the Waianae coast, whole families can get involved, said Acosta, who has lived in the complex since 1975. “They’ll be coming to your door, ‘Eh brah, we got one problem. We’re going to knock you out right then and there.’ This is how the perception is,” he said. At the advice of its lawyer, the association put up the “No Trespassing” signs, Acosta said, in case anyone gets hurt. The fights have gotten the attention of Waianae High School and Waianae Intermediate School. Disa Hauge, principal of the high school for the past three years, said the school only has legal authority over what occurs on campus, unless the problem off campus creates disciplinary issues at the school. However, when staff members hear that students are planning to fight after school, they’ll alert the police and try to find the students to mediate or get parents involved, she said. If students are suspended for fighting on campus, the punishments include being barred from the senior prom or walking in the graduation ceremony. Waianae High School and Waianae Intermediate School are aware of off-campus fights and say they’re trying to encourage their students to make good decisions. Since she’s been principal, she said the number of fights has decreased. She credits that to the “positive behavioral intervention system” being developed by the Department of Education’s Nanakuli-Waianae Complex Area. John Wataoka, principal of the intermediate school, said the school encourages its students to stay on campus by offering after-school athletics and enrichment programs. About 250 of 900 students stay on campus to engage in various activities until 5:30 or 6 p.m., he said. “Our goal is to really provide the students opportunities so they don’t make those types of decisions where they could get into a fight, hurt one another,” he said. While he’s only been principal at the intermediate school for one year, Wataoka has worked as an educator in Waianae for the past 16. He said he thinks it’s only a small minority of youths that fight. Max Holloway, the Ultimate Fighting Championship’s interim featherweight titleholder, grew up in Waianae and said when he was in intermediate and high school, the fighting was about earning respect, but also part of the culture. Deborah Spencer-Chun, CEO and president of Adult Friends For Youth, an organization dedicated to redirecting youth from violence, drugs and negative behaviors, describes that fight mentality as being about negativity and peer pressure. “They can’t back down. They have to be tough,” she said, adding that kids who pressure others have often been victims themselves. 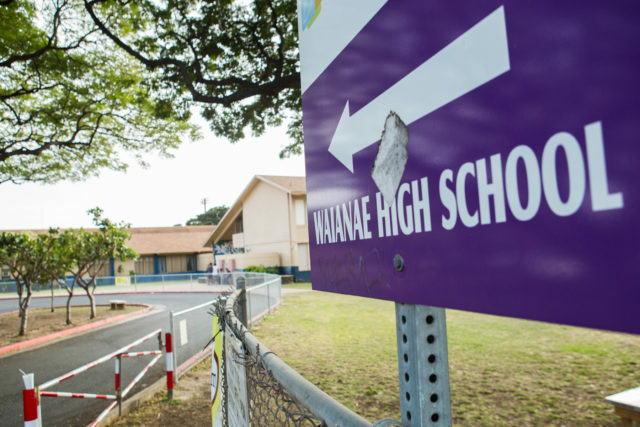 The organization got involved at Waianae Intermediate School about 10 years ago after hearing concerns that students were not showing up to school and were getting into trouble on the streets. 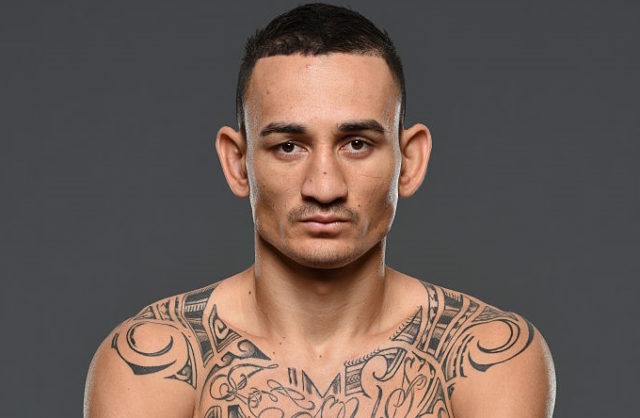 Max Holloway, the UFC’s interim featherweight titleholder, grew up in Waianae. Waianae is not the only community where kids fight. Spencer-Chun said Adult Friends For Youth has seen fights in other communities, like Kapolei and Kalihi. She added that sometimes kids can get seriously injured. Social media also plays a role in the frequency of fights, with teens pressured to act if they’re challenged online and others – even families – being encouraged to watch. Spencer-Chun said the organization has dealt with situations where parents have jumped in or even initiated a fight, though it’s not common. For the past 30 years, the organization has gone into communities to work with high-risk youths. 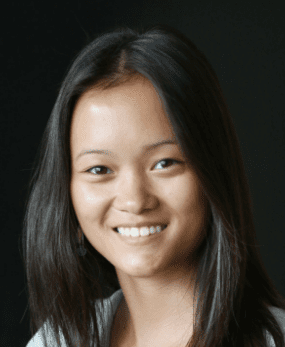 Spencer-Chun said her staff will track down teens who are fighting or engaging in other negative behaviors and try to agree to contracts with them – with permission from their parents and their schools. Staffers in the community hold weekly group sessions, in addition to individual sessions as needed or when fights occur. Spencer-Chun said her organization is aware of the fighting in Waianae, but can’t do more without additional money, especially because of the cost of following the kids who have agreed to contracts for several years. The fights have persisted in Waianae because the community hasn’t really addressed the problem, said McKay “Mac” Schwenke, Adult Friends For Youth vice president. State Rep. Cedric Gates, who represents Waianae, Makaha and Makua, said the community needs to mentor young people and provide role models. He grew up in the area and became aware of the after-school fights at Ulu Wehi when he was a first-grader. He said kids need other, positive outlets. Holloway said youths who want to fight should go to the Waianae Boxing Club just down the street from the intermediate and high schools. 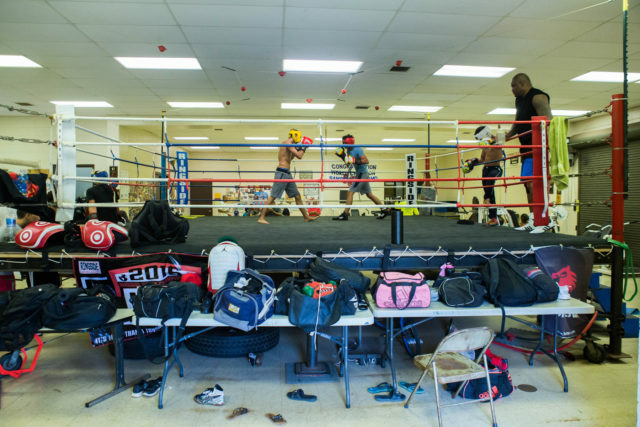 Waianae Boxing Club Coach Fred Pereira said youths who get into street fights are suspended from his club. “Use all that negative energy toward something positive,” he said. Waianae Boxing Club coach Fred Pereira agrees. He opened his club in 1968 in his garage to help prevent kids from getting into trouble. It’s now located at the Waianae Recreation Center, next to the public library, open every weekday from 2:30 to 5:30 p.m.
As many as 70 people train at the club, ranging in age from 5 to 59. His club has produced many champions, with some turning professional. Pereira said it’s often the medals, given to boxers whether they win or lose, that attract young people. They learn discipline as they realize they can’t get better without listening to their coaches. He suspends kids who get into street fights, typically for two to three weeks. And he’ll also hand out suspensions to kids who tell him about a fight that they did nothing to stop, as he did in December with four boxers involved with fights at Ulu Wehi. 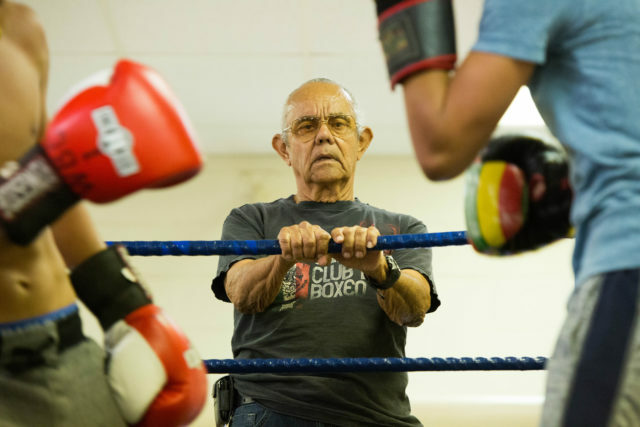 Fred Pereira started the Waianae Boxing Club in 1968 out of his garage. Three suspensions and you’re out of the club. Pereira tells them that by fighting on the streets, they’re putting the club at risk. Pereira encourages parents who are having trouble with their kids to come to him.